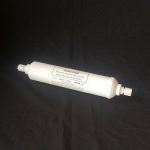 10JG5M LG Fridge Water Filter BL9808, 3650JD8050A, DD-7098 USA made Generic In-Line Water Filter. Used on LG, Daewoo, Miele and Smeg Fridges. USA made Universal refrigerator Ice & Water External Filter replaces all old part numbers including Chungho Microfilter, LG BL9808, DD-7098, 3890JC2990A, 5231JA2010B, Smeg WF003, BFFR Miele & LG BFFR, BL9808, 3650JD8050A, 5231JA2010A, 5231JA2010C, 5231JA2012A, 5231JA2003A, 3219JA3001P, 3840JD2405B, Bosch 497818, Daewoo DD-7098 GE GXRTOR, GXITD, GXITQ, Amana RO183114, RO185022, WF270 Replaces all brands of external in-line fridge filters including Smeg in-line filters. This in-line filter is easy to fit with quick connect push-in 1/4″ tube fittings suitable for plastic tubing and copper pipe. 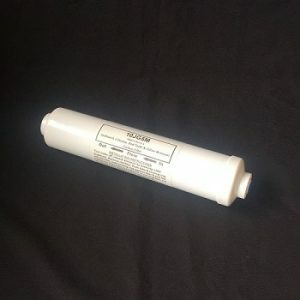 Some original filters have a plain stem at each end that attaches to the plastic tubing with an adaptor fitting, with these filters simply remove the adaptor fitting and the tube will push straight into the new filter. 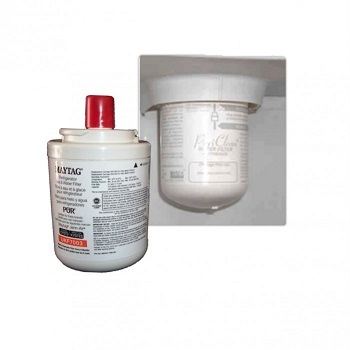 5 micron rating will remove sediment, chemicals, bad taste & odours. Dimensions are 250mm x 50mm Maximum service life of up to 6000 litres.